Our very own Belgian pride and groundbreaking producer CJ Bolland will be dropping by at this edition. He started his career at R&S Records and delivered several huge hits as Horse Power and Sugar is Sweeter, next to loads of other significant releases. He’s also known as an outstanding remixer who delivered remakes for the likes of Depeche Mode, Moby, Sven Väth, Orbital and Tori Amos to name but a few. Even though his sound has evolved through time, we know he still loves old skool acid, so you can expect a tweaking acid set plenty of 303 delights. We are also very honored to invite the one and only Beverly Hills 808303, hailing from Den Hague in Holland. This will be a unique and very exclusive performance not to be missed! Beverly Hills 808303 brought his first set since 10 years at last year’s edition of Bangface and blew people’s minds. 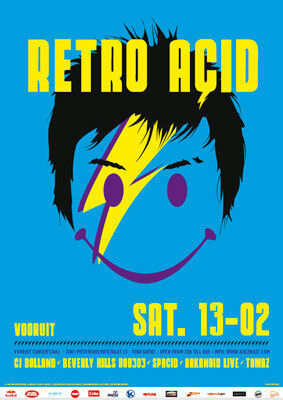 This time, he will be blowing our minds at Retro Acid! Ferenc E released under various monikers such as I-F, but it’s under Beverly Hills 808303 that he delivered several great acid records during the mid ‘90’s. They appeared on the most prolific acid labels of that time: Acid Planet, the precursor of Bunker, his own imprint Reference Analogue Audio and Drop Bass Network for example. Everything he released was groundbreaking, continuously pushing the envelope. Currently Ferenc E is still pushing underground electronic music through his radio show Intergalactic FM (intergalacticfm.com) and continues to be a big inspiration for too many artists. For Arkanoïd it will be his 4th visit to Retro Acid and we know why. This Belgian acid maestro has released records on various foreign labels from Germany to the States. And of course, there is also his output on his own label Binary Bassline Records. On top of that, he is known never to perform the same live-act twice. Tomaz is a regular guest in clubs and on events such as Silo, Fuse, MadeinBrussels and many others. We also know him from his great techno selections on Switch on Studio Brussels. He’s been a part of the scene since the very beginning and will dig deep in his extensive acid collection. And he’s not the only one who possesses a huge acid collection, also Spacid, who was at the forefront of the underground party-scene in the ‘90’s through his Funky Green Aliens organization, has been pushing the early acid sound in Belgium since the very beginning.